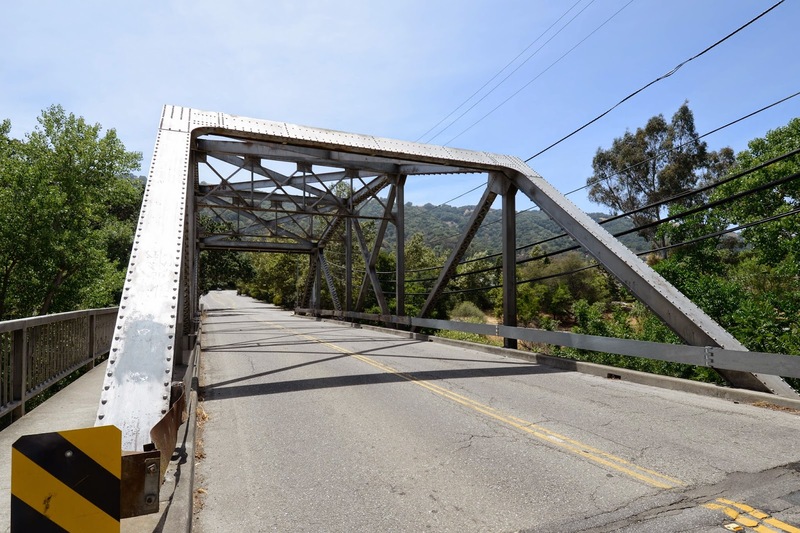 The last bridge we'll study in Alameda County is the Bernal Avenue Bridge (33C0132) across the Arroyo de la Laguna. Like the recently studied Verona Avenue Bridge it's another Camelback Pratt truss, but only 131 ft in length. It's composed of five panels with diagonal truss chords pointing down towards the middle of the bridge and with the diagonals forming an 'X' in the center panel. The bridge provides 15.8 ft of vertical clearance. The low point appears to be the cross frames on each end of the center panel. There's a single sidewalk cantilevered outside of the truss on the south side of the bridge. Note the steel struts attached to the abutments. Perhaps they're a retrofit meant to keep the truss on the abutment seat during an earthquake? This bridge was originally built in 1941. Alameda County, California Bridges: Bernal Avenue Bridge across Arroyo de la Laguna by Mark Yashinsky is licensed under a Creative Commons Attribution-NonCommercial-NoDerivatives 4.0 International License.